Pictured Above: Kumsusan Palace of the Sun (formerly “Kumsusan Memorial Palace”). 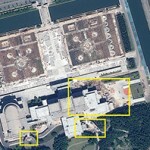 On the left is an image from Google Earth (2012-6-20). 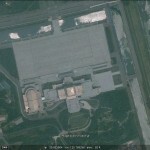 On the right is an image from GeoEye (2012-10-14). North Korea has unveiled the embalmed body of Kim Jong-il, still in his trademark khaki jumpsuit, on the anniversary of his death. Kim lies in state a few floors below his father, national founder Kim Il-sung, in the Kumsusan mausoleum, the cavernous former presidential palace. Kim Jong-il is presented lying beneath a red blanket, a spotlight shining on his face in a room suffused in red. North Korea also unveiled Kim’s yacht and his armoured train carriage, where he is said to have died. Among the personal belongings featured in the mausoleum are the parka, sunglasses and pointy platform shoes he famously wore in the last decades of his life. A MacBook Pro lay open on his desk. North Korea unveiled the embalmed body of Kim Jong Il, still in his trademark khaki jumpsuit, on the anniversary of his death Monday as mourning mixed with pride over a recent satellite launch that was a long-held goal of the late authoritarian leader. Kim lies in state a few floors below his father, national founder Kim Il Sung, in the Kumsusan mausoleum, the cavernous former presidential palace. Kim Jong Il is presented lying beneath a red blanket, a spotlight shining on his face in a room suffused in red. Wails echoed through the chilly hall as a group of North Korean women sobbed into the sashes of their traditional Korean dresses as they bowed before his body. The hall bearing the glass coffin was opened to select visitors — including The Associated Press — for the first time since his death. North Korea also unveiled Kim’s yacht and his armored train carriage, where he is said to have died. Among the personal belongings featured in the mausoleum are the parka, sunglasses and pointy platform shoes he famously wore in the last decades of his life. A MacBook Pro lay open on his desk. Pyongyang, November 9 (KCNA) — Service personnel, officials and working people carpeted the plaza park of the Kumsusan Palace of the Sun with turf of new species. They created the lawn covering the area of tens of thousands of square meters in a short span of time with a single-minded desire to spruce up the area around the palace where the great Generalissimos Kim Il Sung and Kim Jong Il lie in state for perpetuity. The lawn represents the ardent wishes of the service personnel and people of the DPRK to hold the great Generalissimos in high esteem for all ages. They laid earth of 86 000 cubic meters on the ground to completely replace the former ground in a matter of several days. They devoted themselves to such work as burning earth and humus soil and sowing the seeds of turf, covering up seeds with soil and taking care of them. They provided the best conditions for the growth of the turf of new species by covering the area with fertile soil and humus of 12 000 cubic meters. The seeds of all turfs sprouted in a matter of four-five days since their sowing and each has now two-three stems. UPDATE 1: Raymond Cunningham photos of the place here. ORIGINAL POST (2012-11-4): A few days ago I worked on this story for Radio Free Asia. The story highlights construction work being done at Kumsusan Palace. To date this work has not been reported in the North Korean media. What do we see? Most obviously, the large concrete plaza in front of the palace is being converted into a large park with new fountains and displays. The former plaza was approximately 94,000 square meters of flat concrete blocks (according to Google Earth measurements). The new park in the plaza takes up approximately 57,000 square meters, or 60% of the real estate. This will prevent the sort of large scale military ceremonies that have taken place in the plaza over the years, however it will make the facility more enjoyable as a proper park. 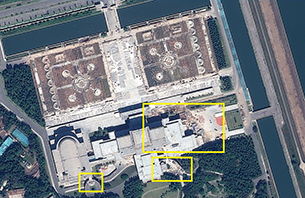 We can also see that the main building is surrounded by debris (outlined in yellow), indicating that significant renovations are taking place within the building itself. Since the DPRK has announced that Kim Jong-il’s body will go on display like that of his father, Kim Il-sung, we can expect that exhibits on the life and accomplishments of Kim Jong-il are being added to complement the Kim Il-sung exhibits. Given the date of the satellite image it is likely that the project will not be completed before winter temperatures arrive. It is possible that construction could come to a halt in the winter, yet I suspect that the North Korean workers (probably soldiers) will have to labor through the winter for a grand public opening on February 16th next year. The construction work has yet to be announced in any official North Korean media outlet, and the cost and scale of the renovations are currently unknown outside of the DPRK. 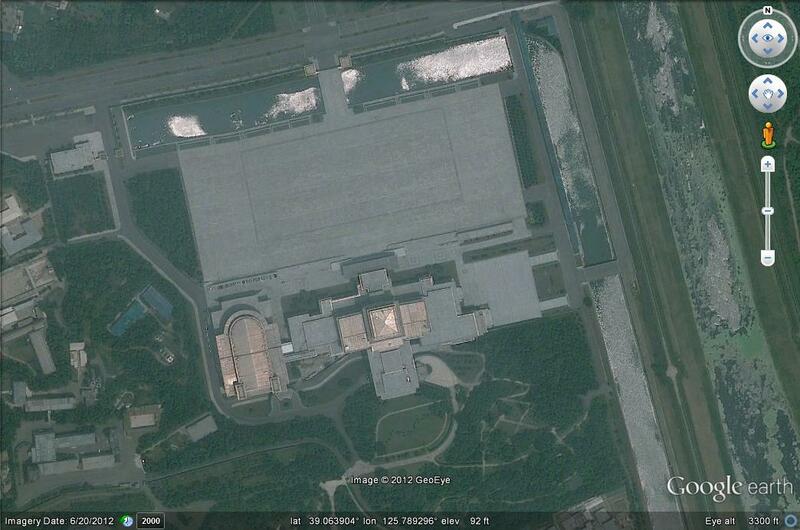 The facility has not seen this scale of work since it was transformed following the death of Kim Il-sung. During the renovations, the DPRK was widely criticized for spending millions of dollars on the palace even as many experienced food shortages and starvation throughout the country during the “Arduous March”. This entry was posted on Monday, December 17th, 2012 at 6:37 pm and is filed under Construction. You can follow any responses to this entry through the RSS 2.0 feed. Both comments and pings are currently closed. Thank you, curtis. After RFA broke the story, the S.Korean National Intelligence Service followed up on it, and commented on the renovation at a South Korean National Assembly session. Kim Jong-il is presented lying beneath a red blanket, a spotlight shining on his face in a room suffused in red.